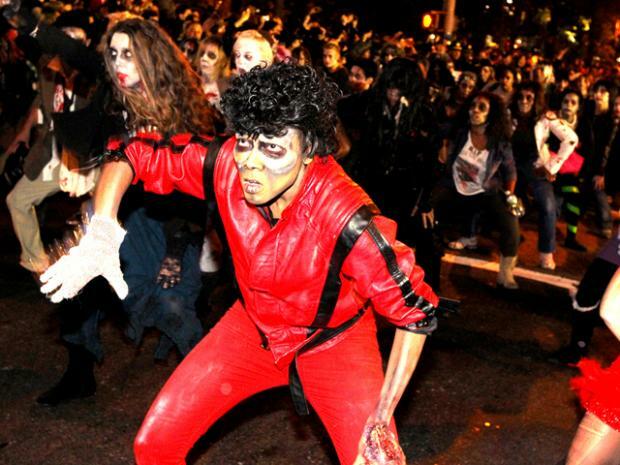 MANHATTAN — It's time to dust off your "Thriller" zombie makeup — again. More than 2 million people are expected to swarm Sixth Avenue Wednesday, Oct. 31 for the 39th annual Village Halloween Parade. This year's festivities will include hundreds of puppets, 53 bands and thousands of parade participants in some of the world's most creative costumes. This year's spooky theme, "Tick! Tock! ", explores the end of time in the final year of the Mayan calendar. "We think of time as infinite, yet modern physicists tell the story of its beginning, and ancient calendar-makers tell of its end," the parade's website explains. The lead float in the parade — which officially starts at 7 p.m. and will move north on Sixth Avenue — will include pocket-watch-bearing white rabbits and winged alarm clocks, the site said. The giant spider puppet that dangles ominously from the Jefferson Market Library Clock Tower will return to the parade this year after a four-year absence while the Greenwich Village library was renovated. The giant spider puppet will be joined by a giant octopus, which will be made by master puppeteer Basil Twist. The theater education group Camp Broadway will salute two cult classics with a mashup dance inspired by "The Rocky Horror Picture Show" and "Carrie: The Musical." The dance will be performed for the first time this year. The annual "Thriller" dance opened for registration Monday, and four rehearsals will be held before the big night, according to ThrillerNYC.com. The site notes that zombie bouncers are still needed for the dance. On the night of the parade, anyone in costume can line up to join the parade between 6:30 and 8:30 p.m. on Sullivan and Broome streets just east of Sixth Avenue, at Sixth Avenue and Canal Street, or at Watts Street just west of Sixth Avenue. Everyone in the parade is eligible to win the costume contest. "Secret scouts" will canvas the parade looking for the best get-ups and will hand out contact cards to contenders. The winner will be selected from those that respond to the organizers, according to the parade's website. Prizes for the winners of this year's contest haven't been announced yet, but last year's victors went home with a weekend stay at the InterContinental New York Barclay Hotel on East 48th Street and tickets to the off-Broadway plays "Stomp," "Fuerza Bruta: Look Up," "Standing on Ceremony," "The Fartiste" and "The Voca People." The official Village Halloween Parade After Party will be held at Webster Hall, at 125 E. 11th St., which will be dubbed Webster Hell for the evening. Starting at 8 p.m., revelers aged 19 and up can be engulfed by "heart-pounding dance music" in a four-story "twisted mausoleum," according to the club's website. Webster Hall will hold its own costume contest "at the stroke of midnight," when one lucky winner will be awarded $5,000. But make sure to step up your Halloween game. "This is not an ordinary costume contest where some CVS makeup and fake blood will get you the cash," the club's website reads. "This is the king of all costume contests … Expect to see some of the scariest, sexiest and most creative and complex costumes seen anywhere." The makers of the fruity malt liquor Four Loko will be at the party to fete the holiday as "Lokoween," according to maker Phusion Projects' website. General admission tickets are available online for $40 each. 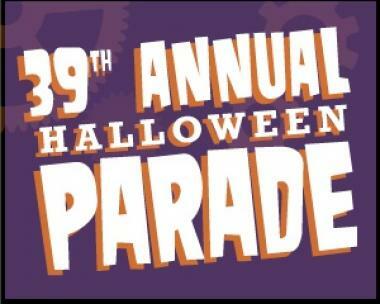 Those who prefer to get their frights from afar can watch the parade on WPIX 11 starting at 7:30 p.m. and NY1 starting at 8 p.m.
Information on street closures and changes to subway and bus service because of the parade was not immediately available. People from all over the world have taken to Facebook to tell the organizers they're getting into the Halloween spirit. Chris Foott, who lives in Manchester, England, wrote that he and his new wife will attend the parade as Jack Skellington and Sally from the movie "The Nightmare Before Christmas." "Looking forward to [this] as part of our honeymoon," he wrote. Facebook user Kelly Larkin said she was traveling even further for the Halloween festivities. "We will be coming from Tasmania, Australia to participate!!! Can't wait!" she wrote.